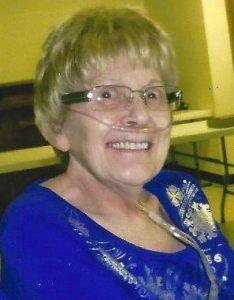 Peggy Rae Grady, age 78 of Hot Springs, SD went to be with her Lord and Savior on April 2, 2019. She passed away peacefully with her children and grandson by her side at Fall River Hospital in Hot Springs, SD. Peggy was born January 28, 1941 to Earl and Grace (Ryerson) Grady in Valley City, ND where she was raised and lived until 1972. She and her children moved to Dickinson, ND. where she attended nursing school to be an RN, receiving her associates degree in 1974. After graduating she began her career at the VA Medical Center in Hot Springs SD where she cared for veterans for 30 years. She also earned her bachelor of science degree from SDSU in 1992. She enjoyed nursing and would not have retired, if not for a back fracture that made it impossible for her to continue working. Peggy was a proud member of Cascade Road Baptist Church and loved her church and church family. She supported multiple charities and ministries. Her heart especially went out to the children in need. It gave her so much joy to spend time with her family and friends. She was fond of traveling, having visited various places, including the Bahamas, treating her family and their kids to a trip to Disney World in Florida and taking the grand kids to Hawaii for snorkeling and deep sea fishing. She liked to play bingo, cards, dice and dominoes with her friends. She also held season tickets the Black Hills Playhouse for a few summers. She liked gardening, home-canning, cooking, baking, camping, and fishing. She was a past member of TOPS, Kiwanis, and the Hot Springs Senior Citizen Center. She was a wonderfully warm and loving person. She was also quite witty and very funny with a great sense of humor, her laugh was contagious. She was so dear and will be so very missed. Grateful to have shared Peggy’s life are her brother, Pat Grady, two children, son and primary caregiver, Jon Lang, daughter, Brenda (Mark) Steffen. Three grandchildren, Jason Lang, Bella Lang and Mark Steffen Jr. (Whitney McGowan). She is preceded in death by her parents and her two sisters, Darlene and Alene. Memorial services will be held Friday, April 12, 2019 at 2:00pm at Cascade Road Baptist Church on Hwy 71, Hot Springs, 57747. Committal services following at Evergreen Cemetery. A memorial has been established in Peggy’s name to Cascade Road Baptist Church to support and continue God’s work that she was so passionate about. Arrangements have been placed in the care of Chamberlain McColley’s Funeral Home in Hot Springs, SD.